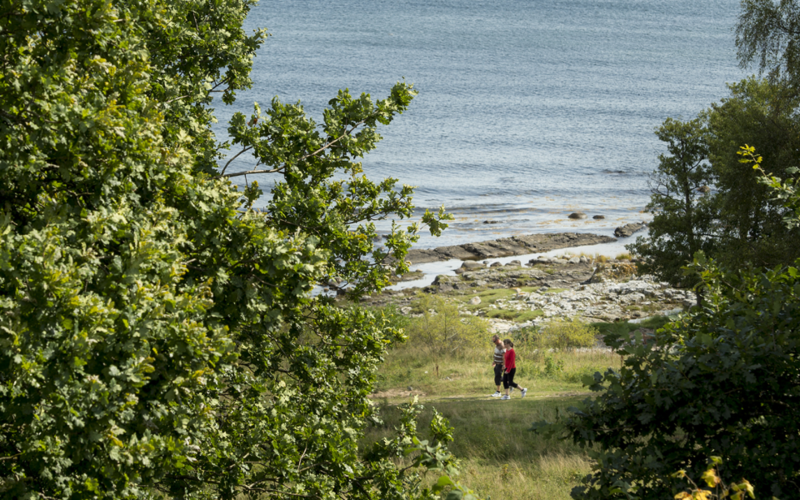 From the medieval town of Simrishamn, this stretch of trail includes sandy beaches, stony coastal meadows, woodland covered cliffs, and Stenshuvud National Park. Near Kivik, you can visit one of the largest Bronze Age stone burial mounds in northern Europe. From Simrishamn, you head north along the east coast of southern Skåne. At Tjörnedala, you walk through a recreation area with deciduous woodland and grazed pastures, where orchids, pasque flowers and cowslips grow. According to Carl Linnaeus, this was one of the most beautiful woodlands in the country. Just to the north you find a sandstone formation resembling a large stone flower with petals one half metre thick. It is referred to as The Priest’s Bath, as rumour had it the local priest used to bathe here. There are around 100 of these formations in Skåne, and this one is the largest. There geological origin has not been established. At Vik, the trail turns inland and passes by hills and fields, with a beach below, only accessible when the sea level is low. 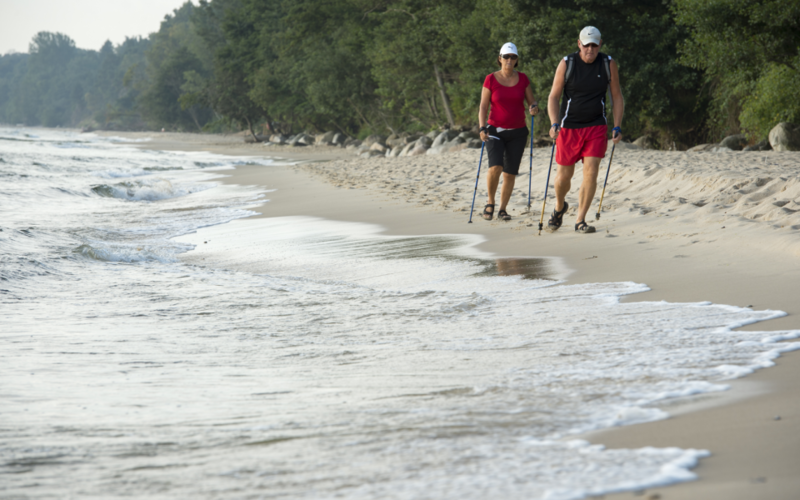 After following the shore at Knäbäckshusen, you start to climb up into Stenshuvud National Park. The surrounding landscape is relatively flat, so the hill – 97 metres high – is visible from far away, and is all that’s left of what was once a much larger mountain range. Hiking this part of the trail is a good cardio workout, but as you climb, you can enjoy the wide diversity of environments here, everything from dry heaths, to wet alder bogs and orchid meadows. Unusual birds, insects and frogs live here, and to the north, you come to the Esperöd arboretum, with exotic tree species. As you approach Kivik, you follow a road lined with small pastures and an abandoned quarry where small, rare animals flourish. 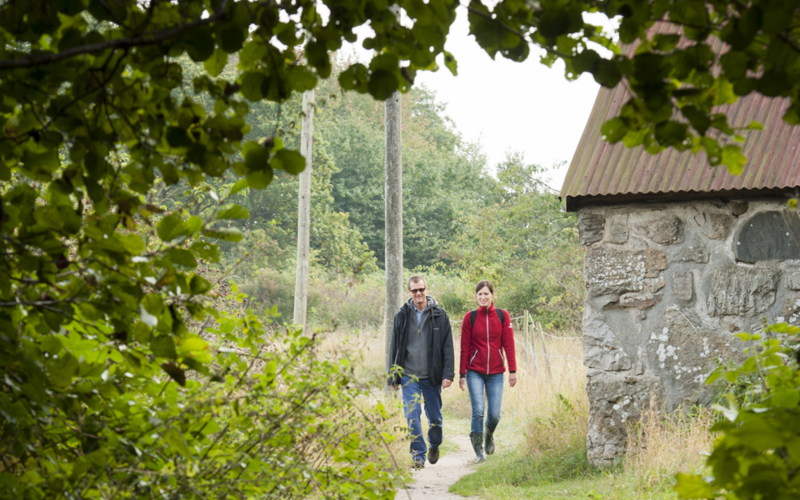 Your starting point is the town of Simrishamn, with its origins in the 1100s. Sankt Nikolai Church in the town centre, with its limestone baptismal font, is from the same period. But human presence goes back much further in time, and there are many Bronze Age (and possibly older) petroglyphs in the surrounding area – figures of ships, sun wheels, axes, and animals chiselled painstakingly into the stone. You can also find elf mills, more commonly known in the world of archaeology as cupules, or bowl depressions. 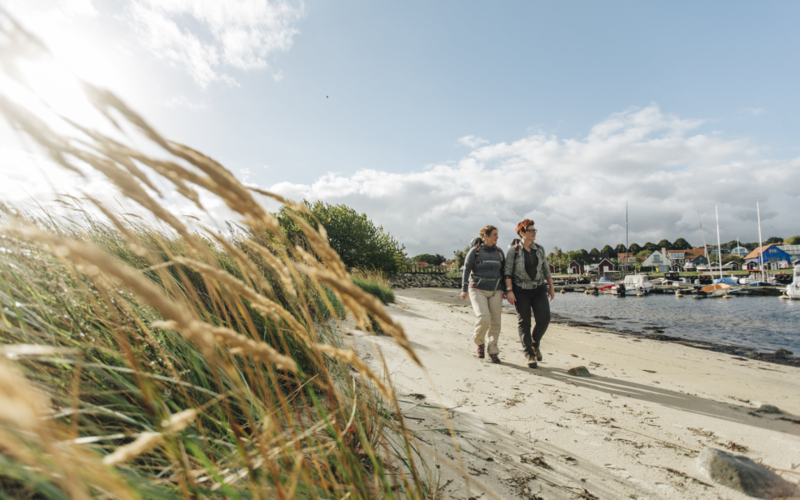 The coastline along this section of trail is dotted with fishing villages including Baskemölla and Vik. These are typical of Skåne, where people were dependent on fishing and farming to survive. In between these two villages, you pass through the rural landscape around Tjörnedalagården, shaped by hay cutting and grazing. On the hill to the southeast of the farm is a cholera graveyard from 1855. About one hundred years ago, the whole coastal area was grazed bare. The woodlands were re-established during the 1900s. Here and there, some trees have had enough time and space to achieve great spreading crowns. The ancient rural landscape on Stenshuvud is still widely grazed. When you walk up towards the top you pass a 210m long wall, the remains of an old hill fort, originating from the time of the Great Migration – 400-550 CE. Close to Kivik you can visit an unusually grand burial mound, c. 1400 BCE, called Kungagraven, or The Kings’ Grave. This monumental burial mound has been plundered, both for its contents and for its stones, but it originally held two cists with petroglyphs on some of the stone slabs. Bone fragments found in the cist have been dated to the Bronze Age, but the remains of a Stone Age settlement have been found beneath the burial cairn. 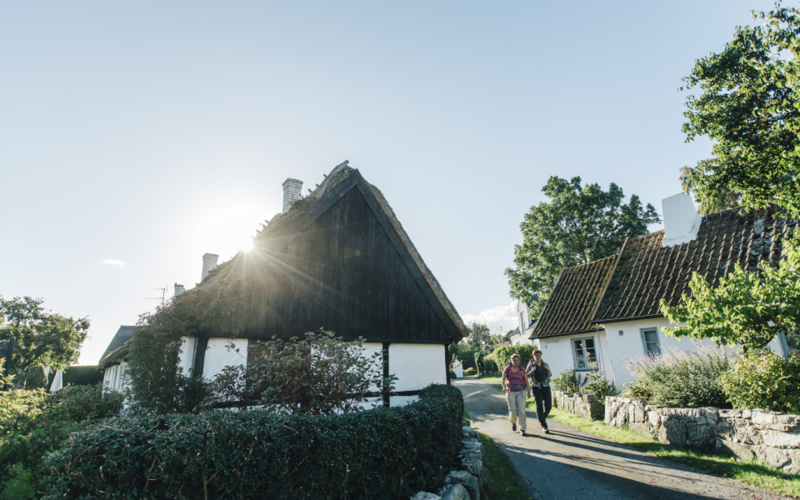 Kivik, once a poor fishing village, is today renowned for the abundance of apples and apple cider produced here.